There are several classic films celebrating anniversaries this year. Ghostbusters is 30 years old this year, Forrest Gump, Pulp Fiction, and The Shawshank Redemption are all 20 years old, and Chinatown, the greatest film noir ever produced, is 40 years old this year. Of all those great films to talk about, I’ve decided to talk about one, and it’s the furthest thing from a classic. 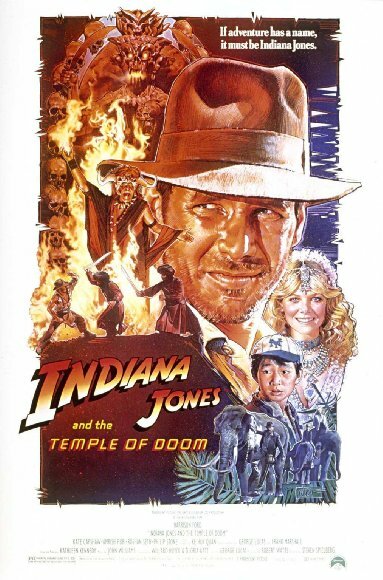 I’m of course talking about Indiana Jones and the Temple of Doom, which just “celebrated” it’s 30 years of existence last month, as it was released to the world on May 23rd, 1984. Now, a lot of y’all are probably thinking, “Jake, you love Indiana Jones. What’s up?” That is very true. Raiders of the Lost Ark is my second favorite film of all time, and The Last Crusade is one of the greatest film sequels of all time (it’s not quite the best, that belongs to Empire Strikes Back and The Dark Knight, along with Godfather Part 2. Lots of great sequels). Obviously, I don’t think Kingdom of the Crystal Skull is a good film, but to be completely honest with you, I prefer that film over the abysmal Temple of Doom. I’ve hated the film ever since I saw it when I was 10, and for several reasons. What I still find odd is that many folks continue to give this film the benefit of the doubt, but then just slaughter Crystal Skull, and that’s just wrong. I’m here to set things straight (and also because I’ve been too busy to go see any new films as of recent. Don’t worry I’ll get back to it soon). Harrison Ford returns as the titular hero, and instead of Indy being briefed on his next mission in the United States by Marcus Brody, we find him already on a mission in China. After that mission is sabotaged, Indy, along with new characters Willie Scott, played by Kate Capshaw, and Short-Round, a small Chinese boy played by Jonathan Ke Quan, find themselves in India, where they uncover a religious cult beneath the caves of India, and all sorts of things are going on. Human sacrifices, child slavery, etc. So Indy and his group of misfits have to set things straight in India to restore balance to the forc- I mean, India. I’ve always said for years that this is Steven Spielberg’s worst film. Spielberg himself thinks this film stinks, later going on to say that the best thing about this film was meeting Capshaw, who he later went on to marry and both have been happily married ever since. I’d probably say that’s the best thing about this film, but other than that, it’s pretty dreadful to watch. And I don’t just say this because of my hatred toward the film, it’s just not a fun film to watch. What made Raiders and Last Crusade so much fun to watch was because it was fun and light, and while it did have some dark moments, there weren’t extensive moments of the film dedicated to the dark and scary nature of the film. Hell, if it wasn’t for this film the MPAA wouldn’t have had to establish the PG-13 rating, because I remember watching this film when I was younger because it was PG and I could, and I was horrified. I couldn’t sleep after seeing the mental image of a man ripping another man’s heart out of his body. I bet if I went through my entire childhood without watching Temple of Doom, I’d probably be a pretty normal, likable kid whose probably the star quarterback on his high school football team, but thanks to this film I’m just a lonely critic who keeps to myself. Screw you Lucas. Speaking of which, one of the films excuses for the dark nature of the film is George Lucas claims it was due to his divorce that was happening at the time. Granted, I’ve never been divorced, I’m a child of divorce actually, but I’ve never really wanted to think about annoying ethnic stereotypes, human suffering, or monkey brains during those hard times. Granted, none of the Indiana Jones films have ever been known for being 100% respectful and accurate on third world cultures, but I feel that Lucas and Spielberg really took this one to the extreme, and it shows in the worst way possible. Now, I will admit that the film does have its moments, like some of the action sequences are kind of inventive, especially the sequence on the mine carts. Harrison Ford is fantastic in this role, even if you can kind of tell that he’s not exactly enjoying the material given to him on this film. But those are really the only things that I feel are worth even mentioning in this film that merits a viewing. There is zero chemistry between Capshaw and Ford throughout the entire film, and the chemistry that Spielberg and Lucas attempt to show is very forced and just stupid. Short-Round is a loud and annoying little stereotype that was only there to please the children! (to be honest, I kind of wanted to be Short-Round as a kid, just so I could hang with Indy). And yeah, you could give Lucas and Spielberg the benefit of the doubt for trying something drastically different from the previous Raiders, but it feels maybe a bit too different. The fun and enjoyable nature of the Raiders is tossed out for this bizarrely and unnecessarily dark sequel that doesn’t really benefit anything. The reason I feel this passionate towards Temple of Doom is because when I was younger, we had a Blockbuster (remember those?) out by my house. About 7 or 8 summer’s ago, I decided that I needed to see the Indiana Jones films before the long rumored fourth Indiana Jones film would go into production. I rented Raiders one week, and loved it. The next week, I rented Temple of Doom, and the anticipation of watching the film on V.H.S. was killing me. How could Spielberg top the last film? Does Marion come back? I couldn’t wait. And you could expect my disappointment in the film after so. That’s why I hate Temple of Doom, because it tried something different, and I’m all for different when it comes to movies. But Indiana Jones is so straight forward and light, so it makes very little sense to this day why Spielberg and Lucas decided to go down a much darker road with the sequel. June 21, 2014 in Classic Movie Reviews, Movie Reviews. Temple of Doom caused the PG-13 rating? I always thought it was Gremlins and Jaws.